The Dhaka National Medical College inherits her glorious predecessor the Dhaka National Medical Institute, which was established in 1925 as a part of Non-cooperation movement of the Indian Sub-continent against the British colonial rule, organized jointly by the Indian National Congress and the Indian Muslim Leage under the Leadership of Mahatma Gandhi, Mawlana Muhammad Ali and MawlanaSawkat Ali. Along with other programs the Non-cooperation movement urged upon the peoples of the sub-continent to boycott educational institutions established and administered by British Govt. and to establish National Schools, Colleges and Institutes for modern scientific education by the local people themselves. Accordingly two Medical School were established in the Bengal Province for producing National Doctors of modern medicine. 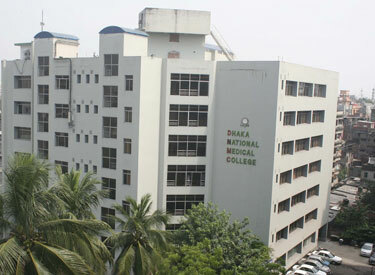 One such Medical School was at Calcutta, named Calcutta National Medical Institute and the other at Dhaka, named Dhaka National Medical Institute.